Surrounded by her loving family Blanche passed away at the Villa Minto in Cochrane on Sunday April 1st, 2018 at the age of 95. She was the wife of the late Albert Blouin, mother of Delbert (Louise) Blouin, late Roy (Betty) Blouin and Linda (Maurice) Charron, grandmother of Harvey Blouin (Marianne), Treena Blouin (Pierre), Jamie (Isabelle) Blouin, Dianne (Lauren) St-Amant, Michael (Nadia) Blouin, Charlene (Tracy) Blackwell, Michel (Shelly) Charron and Lisa (Paul) Bélanger, great-grandmother of 15 and great great-grandmother of 1. She also leaves behind nieces, nephews, other relatives and friends. She was also predeceased by all her sibling and her parents Harry and Amy Laycox. 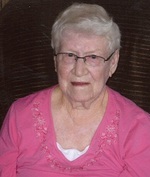 Blanche will be fondly remembered as a lifelong Cochrane resident who enjoyed playing cards with family and friends and listening to her favorite country music. She proudly served as a Second Mile Club member. Visitations will be held at Génier Gauthier funeral home, 70 7th Avenue South, Cochrane, Ontario on Friday April 6th, 2018 from 7 to 9 pm. The funeral service will be held at the Génier Gauthier funeral home chapel on Saturday April 7th, 2018 at 11 am with Pastor Brynn Carson officiating. She will be laid to rest beside her beloved husband at the Cochrane Civic Cemetery at a later date in May. If desired, memorial donations may be made to the Villa Minto and would be greatly appreciated by family.